Are you aware that sliced garlic has a milder flavor than minced garlic? Did you know that creating a well in the center of a raw hamburger patty will keep it from puffing up like a tennis ball on the grill? "The America's Test Kitchen Cookbook" provides these tips and a cornucopia of kitchen wisdom garnered by 12 cooks and a staff of 30. The Recipe Workshop: After preparing more than 50 batches, the chefs develop a heavenly recipe for brownies with a deep chocolate flavor, moist, velvety texture, and a hint of chew. The Equipment Corner: Here, 25 vegetable peelers are rated for grip, sharpness and design. The Tasting Lab: Twenty tasters sample eight of the leading national brands of vanilla ice cream with some surprising results. The Science Desk: Marinades are overrated when it comes to tenderizing meat, despite the fact that the acid (lemon juice, vinegar or wine) in marinades does cause protein strands to break apart. 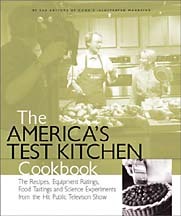 "The America's Test Kitchen Cookbook" is the winner of a prestigious International Association of Culinary Professionals 2001 cookbook award. It offers more than 200 recipes in an easy-to-read format and is a welcome addition to any home library. In the following recipe for grilled shrimp, the shell shields the meat from the intense heat and helps keep the shrimp moist and tender. Pour 2 quarts very cold water into large bowl. Add salt and sugar and stir until dissolved. Add shrimp and let stand 30 minutes. Drain shrimp. Slit the shells (see note). Toss shrimp and oil in medium bowl to coat. Preheat grill with all burners set to high and lid down until grill is very hot, about 15 minutes. Scrape cooking rack clean with wire brush. Leave burners on high. Thread shrimp on skewers by passing the skewer through the body near the tail, folding the shrimp over and passing the skewer through the body again near the head. Threading the shrimp twice keeps them from spinning when turning them over. Grill shrimp, covered, turning skewers once, until shells are barely charred and bright pink, 5 to 6 minutes. Serve hot or at room temperature with lemon wedges. Serves 4 to 8. Note: Before cooking, slit the back of each shell with a manicure or other fine-point, small scissors. When ready to eat, each person can easily peel away the shells.